Ever wondered, why some people are so work concentric and workaholic or maybe they are just too particular to finish their work on time or before in some scanty cases? But there is a breed who knows to push their work to next second, with every second that passes by and they are PROCRASTINATORS. Sounds weighty right? 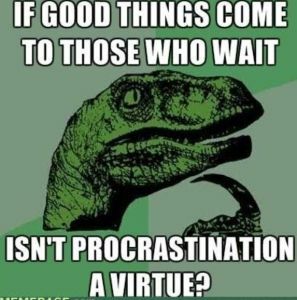 Let me tell you, as my experience/observations say, procrastinating doesn’t make you a evil spirit on earth who is Michael Angelo in wasting time and not finishing the work on time or at least delaying it. 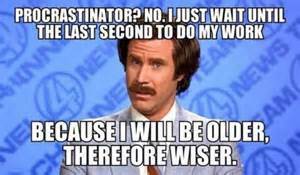 Being a procrastinator makes you a judgmental soul of time, now this sounds super heroic right? Being a “pro” makes you good at analyzing of time and makes you good at deciding of what needs to be done at what time. No matter how well you finish your work on/before time, you would have found yourself squandering some of your trivial work like charging up your laptop, filling up those sad faced empty bottles or out folding your socks, no one is left untouched with this new disease. And this goes without saying that this is also a negative impacting aspect that will obviously make some of your important tasks go ruin without being fruitful to you. There’ no cure other than pulling yourself up to the work and finishing and no one can help in this, but you. Procrastinate smartly and make sure it doesn’t hinder your present and future self. ← You no more need password to login to your google account.